Natures ayurved makes the bold claim that hemorrhoids can be cured in the initial stages with herbal medication. Created to correlate with the Eastern Ayurverdic lifestyle, this supplement is for treating hemorrhoids at the initial stages and does so by soothing the burning sensations in the recto region, and hastens the healing of damaged tissues. It furthermore claims to stop bleeding and works as an anti-septic. Contains Berberine to stop bleeding, anti-inflammatory, rumored to cure skin problems and poisoning. Take two tablets after each meal, and it is recommended to be taken with curds to enhance the effect. Six tablets should be taken daily. $51.00 for three bottles of 60 capsules each (30 day supply). Natures ayurved will only refund money for a damaged or faulty product. They offer no guarantee as to the quality or performance of their product. This supplement is intended to be used in accordance with an Ayuverdic lifestyle. 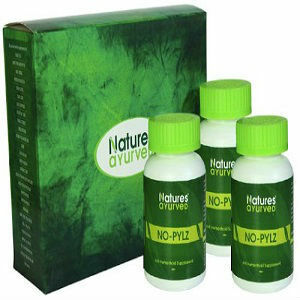 John Parker	reviewed Natures Ayurved NO-PYLZ	on October 22nd	 and gave it a rating of 2.